1. I would make an outline of my book idea ahead of time - There are two categories of writers in this venture according to the NaNoWriMo website. There are the planners. Planners are those who plan out their outlines and characters and do the research ahead of time. The second kind are called Pantsters. Pansters are those who start this process with no planning and fly by the seat of their pants for the entire 50,000 words. There are combinations of the two that are referred to as Plantsters. They combine both methods with a little planning and a little pantsing to get it done. I have discovered that I am not a pantster and I need a plan. Next year I will take October to prepare much better than this year. 2. I would make a chart for characters - I loved a video I just watched about developing a character notebook and I find myself having to backtrack and make some details about characters that I am coming up with. Without the character sketch I am finding myself struggling to develop scenarios and responses of my characters because I have not thought through how they would respond. I need to start a notebook and start developing characters. I know many writers do this and their stories flow from the characters they have built in their research. I am starting that notebook now and will keep it ongoing. When I need characters I will already "know" them to some degree and be able to write more effectively as I tell their stories. 4. I would read other books on writing fiction before starting this process - The more I write the more I realize how little I know about doing this. I know a good story when I READ it but have no earthly idea how to WRITE one. I need better skills and knowledge to make this a real success. 5. I would read FAR more fiction than I have to this point in my life - I have been so into non-fiction for so long I tend to write like that. I am making a goal for 2017 to read FAR more fiction and historical fiction specifically. I am a firm believer in reading good fiction to write good fiction. I think it is super important to read a lot from the genre you want to write in. I plan to make this new habit a priority. 6. I would take a creative writing class - This one is HUGE for me. I have already looked into some continuing education class schedules for the coming year. I am researching some online writing courses that are legit. There will be a six week course or two for me in this subject. I don't believe you HAVE to take creative writing to be a creative writer but my personality is one that needs a class to give me some ground rules to keep me in line. The ISTJ is not necessarily the best storyteller.... or are they? I know I like lots of details and research and I love finding little tidbits that are exciting and cool to share. I think the ISTJ, and me in particular, would be rather good at writing historical fiction. The only problem is the lack of creative artistic feel to my writing but I don't think that is an impossible obstacle. I think with a little push in the creative writing realm I could soar at that. I may never be an award winning writer but I can, at the very least, improve my skills and as an ISTJ that is very appealing. 7. If you write historical fiction there is A TON of research that should be done BEFORE you start writing. I am writing an historical fiction work and the more I write the more I have to stop and read things about what I am writing. I know I could keep going and make it up and correct the inaccuracies later but I stop.... and I read.... and I research... and get drawn into the history... and forget to write. LOL I would read ahead if I had it to do over again and for next year I will think through what I want to do and start reading from that time period several months in advance. I am learning that it takes WAY more than a month to truly write a novel but the daily writing is the best practice I could imagine so I will keep going. 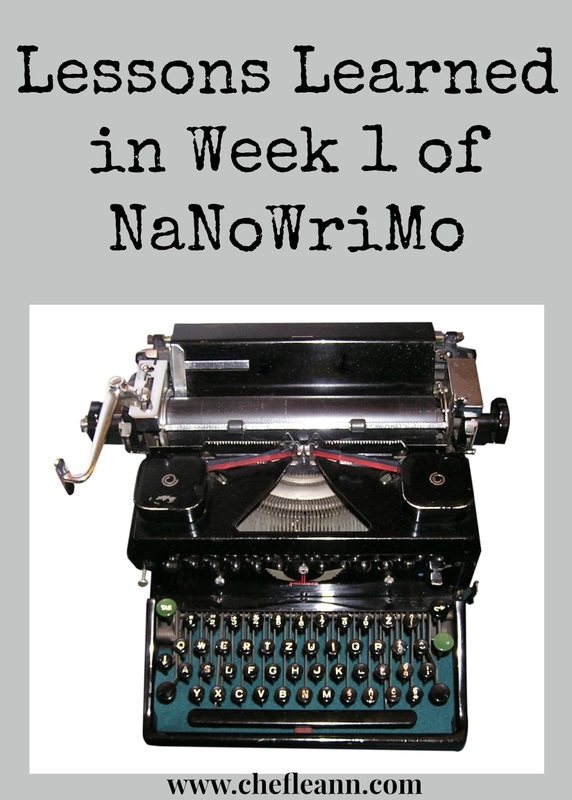 Are you writing a novel this month? Have you learned anything through this process? Feel free to share your observations in the comments below or link me to a post you have written on your own writing adventures! I'd be more of a planner, but I've had times when "pantser" was not only an apt description, but yielded better results. Sometimes, you can plan yourself into a corner. I've found the issue with reading tons of fiction is that as you develop favorite authors/genres, you find your writing voice mimicking them. Not always a bad thing, if you are aware of it and can use it as a jumping off place to finding your unique voice, but it can be a pitfall if you aren't aware of it. Had to chuckle at the mention of historical fiction and research. I'm rereading The Song of Fire and Ice books...George Martin doesn't just create one fantasy world based on medieval times, he creates at least a dozen, all interwoven. The terms he uses for clothing, horses, arms, parts of castles, defenses...all historically accurate, even though he's using them in lands where dragons and magic are real. Just thinking about the amount of research needed for something like that is daunting.